The marvel comic book character Spider-Man has faced off against villainous bad guys, some of which became his classic archenemies supervillains including The Lizard, Dr. Octopus, Green Goblin, Rhino, and Mysterio. However, one of the most infamous foes that Spider-Man has come across is the vileness being known as Venom, an alien Symbiote with an amorphous, liquid-like form that requires a host (usually a human to bone with for its survival). While he has appeared in several other comics books (within the Marvel comics franchise), Venom is commonly associated with Spider-Man, with Peter Parker being the first to merge with the alien parasite (for a brief time) before merging human Eddie Brock, its second and most infamous host in the Spider-Man lore. Of course, with the rise of superhero cinematic adventures that began in the early 2000s, Sony / Columbia Pictures began to producing theatrical feature films of Spider-Man, beginning back with 2002’s Spider-Man that featured the acting talents of Toby Maguire, Kirsten Dunst, and James Franco. By 2007, the third installment titled Spider-Man 3 was released, which boasted the cinematic reveal of character Eddie Brock and the Symbiote “Venom” pairing. Unfortunately, while the movie went on to become the highest grossing film of the trilogy (grossing over $890 million at the worldwide box office), the movie faced mixed / average reviews from both critics and moviegoers, especially given how the character of Eddie Brock (played by actor Topher Grace) and how Venom was a bit underwhelming against the film’s other two villains. These mixed reviews of the movie prompted Sony to cancel a fourth Spider-Man installment and instead “reboot” the franchise altogether with The Amazing Spider-Man in 2012 (with a new cast) then cancel that “reboot” franchise until Disney and Sony made a licensing deal that would allow the character of Spider-Man to be a part of the Marvel’s Cinematic Universe, with actor Tom Holland currently playing the role of Peter Parker. However, the character of Eddie Brock / Venom has remained in the dark (cinematically) since his 2007 debut. Now, Sony / Columbia Pictures and director Ruben Fleischer finally present a spin-off Spider-Man to feature Eddie Brock and his “bonding” with the Symbiote in the movie titled Venom. Does this side-story movie of focusing on one of Spider-Man’s arch-nemesis do the comic book character justice or is it simply a “turd in the wind”? Living in San Francisco, Eddie Brock (Tom Hardy) is an investigate journalist, leading his own TV show on a news network, while enjoying a good even-keel life with his fiancé Anne Weying (Michelle Williams). 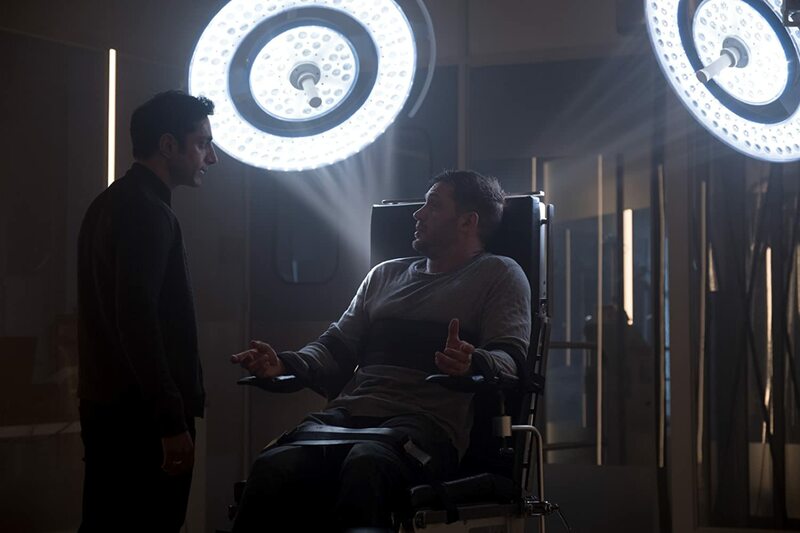 However, Eddie betrays the trust of his fiancé and ignores specific instructions from his boss when he goes to interview business mogul / scientist Carlton Drake (Riz Ahmed), who is the CEO leader of the Life Foundation. As a result, Eddie is fired from his show, blacklisted from working in the journalism field, and (to make matters worse) Anne breaks up with him. Months later, Eddie is still down on his luck, unable to find a job or lead a fulfilling life until he’s approached by Life Foundation scientist Dr. Dora Skirth (Jenny Slate), who explains that Drake has been experimenting with alien creatures he’s called symbiotes. The smybiotes must “bond” with an Earthen host in order to survive on the planet as Drake plans to fuse symbiotes with humans as a way to survive in space; though the symbiotes (more often than not) reject the human host and kills them. When Dr. Skirth sneaks Eddie into the Life Foundation’s research faculty, one of the symbiotes named Venom bonds with Eddie and the pair help to keep each other alive. While Eddie struggles with the idea of his parasitic host, Drake soon discovers what Eddie has done, ordering men to hunt him down and take back what is rightfully his. However, unbeknownst to all of them, another symbiote named Riot has his own plans. Of course, I’ve been a fan of Spider-Man. I wouldn’t say that I’m a super “die-hard” fan (that’s more of X-Men comics and the Guardians of the Galaxy), but everyone’s “friendly neighborhood” is one of those characters that I remember vividly in my liking of all things comic book superheroes. Perhaps my best remembrance of Spider-Man came in the form of the 90s cartoon show (i.e. Spider-Man), which introduced me to many of the web-slinger’s villains that Peter Parker faces, including the character of Eddie Brock and his Symbiote counterpart of Venom. Naturally, as the Spider-Man movies (and several other superhero films) were being produced by in the 2000s era, I kept wondering if the either the character of Eddie Brock or Venom would show in one of these films, which both did in 2007’s Spider-Man 3. However, much like a lot of viewers out there, I thought that Brock / Venom’s appearance in the movie was pretty “blah”, especially given the fact that he gets somewhat “lost” in the feature (showing up towards the tail end of the movie) and being underwhelming to say the least. Plus, not bash his acting talents or anything like that, but I just felt that actor Topher Grace wasn’t exactly the best fit for Eddie Brock and his iteration of Venom was less-than desirable. There were other problem with Spider-Man 3, including the horrid dance number scene, but suffice to say that Venom’s live-action cinematic debut received mediocre taste. Naturally, this brings me back to talking about Venom, the latest 2018 superhero movie from Sony Pictures. Much like what I said above, Venom’s depiction in Spider-Man 3 wasn’t the greatest and none of the other live-action iterations (i.e. The two Amazing Spider-Man films nor the current iteration of Spider-Man within the MCU) has ever “hinted” at a possible Venom storyline appearance. Of course, this is probably due to Sony Pictures licensing agreement with Spider-Man of which the movie Venom is being produced. Additionally, the film’s “buzz” was certainly all over the internet, especially because they (Sony) was doing a full solo / origin feature on the character of Eddie Brock / Venom and not as just a main (or supporting) antagonist in a Spider-Man picture. Also, the casting of actor Tom Hardy as Brock / Venom peaked my interest. I also have to say that there was plenty of inherit hype for this movie, especially how the movie promised to be a “faithful” adaptation to the comic book character and how it would be “different” from the past iteration of Brock / Venom. Thus, I would have to say that I personally was looking forward to seeing this movie when it came out. However, the pre-release reviews for Venom have been less-than desirable, citing that the feature lacked a consistent tone and a problematic script. Because of this, there’s been a shadowy cloud of “doubt” on the Venom movie, with many expecting the movie to be a “bomb”. However, I’m always an optimist, so I went to see the film, hoping that the mixed to negative reviews for the movie were not all true. So, what did I think of Venom? Well, it wasn’t as completely horrible as some of the early reviews were making it out to be. That being said, Venom, while never boring and with an incredibly solid performance from actor Tom Hardy, is a mixed bag that comes off as more flawed than wholesome. It’s still has bits of entertainment, but is too messy and thinly-written in comparison to the superhero film endeavors of late. Venom is directed by Ruben Fleischer, whose previous directorial works includes films like 30 Minutes or Less, Zombieland, and Gangster Squad. Given his filmography background of several more “comical” pieces, Fleischer makes his “superhero” debut with Venom, crafting a feature that has a lot of fans out there, especially to see another iteration of “Venom”. To his credit, Fleischer succeeds on delivering a semi-intriguing cinematic feature that’s full of superhero nuances that bolsters the movie with its action and its frenzy. Naturally, the movie’s opening act is a bit boring, with the movie setting up events and various characters, but a little bit into the second act, the movie kicks into fast-paced / fast-moving with several action pieces, especially noticeable when Eddie and Venom are bonding together for the first time, which (to me) is the best sequence of the feature). In truth, Fleischer keeps events (and the movie) moving on a brisk pace, with the film clocking in at around 112 minutes long (one hour and fifty-two minutes). Thus, barring the first twenty minutes or so, Venom is a straight-forward superhero movie that doesn’t meander through unnecessary side-stories, keeping the narrative on point by following Eddie Brock’s cinematic journey. Additionally, Fleischer also benefits in approaching the movie by having the entire film surrounding the origin tale of Eddie Brock / Venom rather him being a somewhat side-character in another character’s movie (i.e. like what happened in Spider-Man 3). Thus, love it or hate it, Fleischer doesn’t make a fast-paced / semi-entertaining movie for viewers, who just want to switch the brains off for two hours. I do have to say the film’s tone is, more or less, “on point” with itself, being a mixture of that classic superhero vibe as well as having a more comical edge to it, especially given how Hardy’s performance is with both Eddie Brock / Venom (more on that below). Given the nature of this tone, I think that Venom (the movie) and Fleischer’s ultimate direction for the feature is self-aware, playing up the some of the darker humor elements as well as madcap / bonkers for the film’s narrative path in both levity in story. Some fans / viewers out there might be a bit disappointed with type of dark comedy, especially when they were hoping for a “darker” iteration of the Venom (given the fact that the film’s trailers showcased that style of tone). However, to me, it sort of worked, with (again) Hardy’s performance carrying that notion wholeheartedly throughout. Thus, the comedic tone of the feature didn’t bother me, but it might some. On a technical level, Venom is a pretty straight forward endeavor for a superhero feature, producing a lot of the same “look and feel” throughout the movie. Like what I said above, the film is a smaller-scale feature than some of the more “expansive” comic book movies of late, but the movie itself is still presented well-enough to meet the current “industry standard” of a superhero / blockbuster (for the most part). The visual effects in the movie are pretty good. There not super fantastic and cutting edge like some of the recent Marvel movies (i.e. Avengers: Infinity War), but easily get the job done, especially in those moments where Venom’s attacks and appearances in the film. There are parts that are bit messy CGI, but it wasn’t that “glaring” noticeable type. Plus, I have to say that the CGI work for Venom’s fluid symbiote form is much better than his iteration in Spider-Man 3. The cinematography efforts done by Matthew Libatique are also pretty good, capturing some stylish camera angles throughout the feature, which does add to the overall likeable action scenes. Other notable areas, including the film’s editing (Alan Baumgarten and Maryann Brandon), productions designs (Oliver Scholl), and set decorations (Alice Felton) are pretty good in their respective fields that make up the film’s overall appeal. 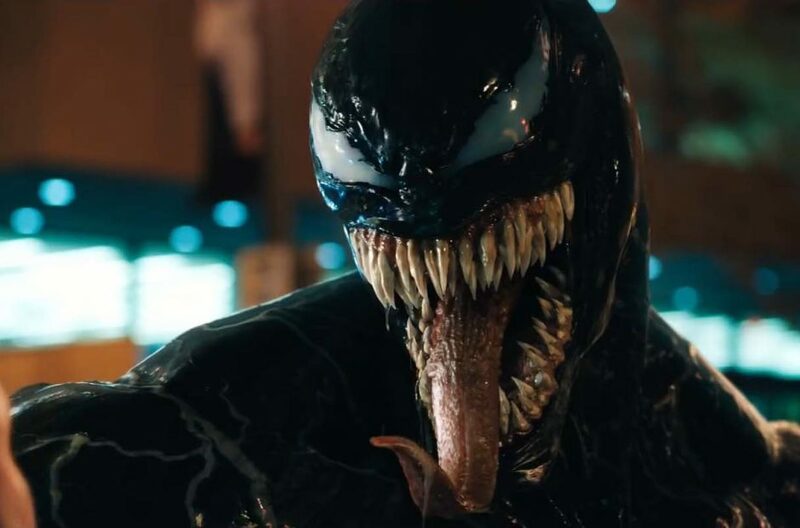 Also, while the film’s musical score, which was composed by Ludwig Goransson is relatively good (maintains the standard musical melodies of a superhero feature, but nothing truly memorable pieces or suites), the song “Venom”, which is sung by famed rapper Eminem, is pretty “meh” to me. Personally, it just doesn’t fit into the movie (even if it just plays during the ending credits sequences). Unfortunately, Venom stumbles more than its strides, with numerous problems that drag the film down and make it much more “less-than-desirable” that was many out there were expecting. Perhaps one of the biggest gripes that I personally had (and the most notable one for many) is how fast the film moves. Yes, I stated above that the first twenty minutes or so is kind of generic and boring, but Venom plays a sort of “fast and loose” with its narrative, quickly navigating a series of sequences that are loosely tied together. Perhaps it’s part of Fleischer’s direction of trying to make things “collide” and keep the feature’s entertainment momentum going (of which he succeeds in some regard), but it sacrifices a cohesive and fulfilling story narrative. The film’s slim runtime also plays a hand at this, which seems to be missing pieces here and there. What do I mean? Well, there are several moments where there should’ve been something (a scene or sequences) that seems like it was “cut” from the final edit of the feature. Thus, Venom seems a bit clunky (at various points) and lacks several areas of understanding certain things, especially a poignant moment as to why Venom decides to side with Eddie Brock. It’s important, but seems to “rush” over the understanding of it all. Yes, rushed seems like the best word to describe Venom (as a whole). There are parts that are good, but it’s overall “hurried” and lacks substance (in both story and character development). Moreover, the culprit behind this might also be from the movie’s script, which was penned by Jeff Pinkner, Scott Rosenberg, and Kelly Marcel (with a story by Pinkner and Rosenberg). Essentially, the script’s story is rather generic, playing up a predictable / formulaic path that rarely deviates from what’s already been done before (in both superhero movies and / or film narratives). Thus, its easily to see where the film is heading before it actually gets there. Additionally, the script’s dialogue is also clunky with several bits and pieces of horrible written dialogue that feels like deadweight. The cast does what they can with that material (somewhat elevating the characters), but it is noticeable on the dialogue is bland and badly written. Also (because I don’t know where to put this), but the film’s climatic ending battle seems a bit “blah”. Yes, it’s kind of cool to see, but its more CGI good guy vs. CGI bad guy that overwrought and seems a bit too much like a video game (something a bit similar to the Hulk facing off against the Abomination in 2008’s The Incredible Hulk). Another big problem that Venom faces is its overall placement in the current age of superhero movies. As I’ve mentioned before in my review for Justice League, superhero movies have evolved since they first became mainstream blockbuster during the early 2000s, transforming classic comic book characters into cinematic iteration that have since added new elements into the mix (i.e. historical, fantasy, heist, political, etc.). Thus, these other genre elements offer a somewhat new façade for the somewhat familiar superhero blockbuster film that many of us have grown accustomed to. That being said, Venom seems more like a step backwards than continuing this recent trend. Why? Well, it’s because that the movie just feels like a standard superhero movie (nothing added or other genre / thematic theme weaved into its narrative). I could sense a sort of “buddy cop” thing going between Eddie and Venom, but that’s about it. Plus, in the film’s grand scheme, it just didn’t have that extra “oomph” that some of the more current superhero movies have (even the DCEU ones), with the film more focused on frantic action sequences than creating a wholesome viewing experience. This is why a lot of people have stated (including myself) that Venom should’ve been released back during the mid-200s era of superhero films and not so much in today’s current filmscape of comic book movie endeavors. 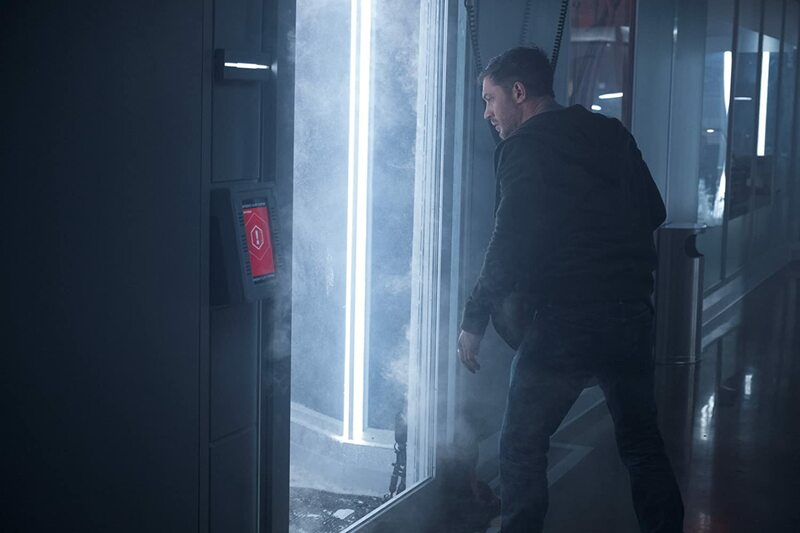 Of the entire cast of Venom, the one who shines the best (and literally carries the movie on his shoulders) is actor Tom Hardy, who plays the film’s protagonist character of Eddie Brock as well as voicing the parasitic Symbiote Venom. While its not exactly his most hard-hitting and dramatic role, Hardy, known for his roles in Inception, Warrior, and The Dark Knight Rises, does exceptionally work in the film, making the film very engaging (and sometimes humorous) in a role that he quite literally “throws himself” on. He has enough manly swagger about him to make the character of Eddie Brock interesting and fun and its quite interesting to see him go a bit “bonkers” when the symbiote known as Venom bonds with him. Plus, since Hardy provides the voiceover work for Venom, its interesting to see the difference facets between the two and how the have to work together. To be honest, Hardy literally (and I do mean it) carries the film on his shoulder in his performance and it ultimately works. I mean, if there was any other actor that was cast in the role, I would’ve not like the movie as much as I did (and I think many will agree with that). My only gripe is not so much on Hardy’s acting talents in the movie (I loved him as Eddie / Venom), but on the fact that there was no Spider-Man in the movie. Yes, I do know that this was suppose to be different and its “own thing” as a standalone endeavor (or at least in Sony’s Marvel universe). Needless to say (as I’m beating around the bush), it would’ve been cool to see Hardy’s Eddie Brock / Venom clash with actor Tom Holland (the current Peter Parker / Spider-Man in the MCU). Who knows…hopefully one day that could be a possibility. All in all, I think that Hardy’s performance is definitely the major pillar of the feature, holding it up throughout all its missteps and miscues. Whatever you take away from Venom (good or bad), there’s no denying that Hardy committed acting talents to the movie is superb. Plus, Hardy’s Eddie Brock is ten times better than actor Topher Grace’s iteration of the same character in Spider-Man 3. Not to knock Grace’s acting ability, but it’s the truth (and I think many will agree to that). The other two “major” cast members behind Hardy’s Eddie Brock / Venom are actress Michelle Williams and actor Riz Ahmed, who play Eddie Brock’s ex-girlfriend Anne Weying and genius inventor and Life Foundation CEO Carlton Drake respectfully. Williams, known for her roles in Manchester by the Sea, The Greatest Showman, and All the Money in the World, is a very talented actress and knows how to handle herself well when on-screen. However, while her acting talents are fine in the movie, she just simple feels out of place in Venom. Her character gets a bit more to do than just the classic love interest in a superhero movie, but it’s mostly how the character of Anne is written (and the clunky script dialogue) is where she stumbles. To be honest, Anne Weying could’ve been played by any other actress out there as Williams doesn’t make the character her own. Don’t get me wrong, I love Williams as an actress, but Anne mostly comes off as a stock-like character (too stiff and rigid). It also doesn’t help the fact that Hardy and Williams have little to zero on-screen chemistry with each other, which makes the believability in Eddie and Anne’s relationship almost nonexistent and extremely hard to “buy into to”. I just didn’t see them together…at all and Williams was simple a miscast. As for Ahmed, known for his roles in The Night Of, Jason Bourne, and Rogue One: A Star Wars Story, he’s gets the villainy down, but just ends up being a generic megalomaniac business / inventor. Much like Williams, his acting is fine, but the character of Carlton Drake is too “cookie cutter” and doesn’t really bring anything new the role of a “villain” in a superhero feature. In both cases (Anne and Drake), the writing could’ve been so much better and could’ve elevated the characters to be more memorable. Unfortunately, the script is too thinly written and clunky to do so, despite Williams and Ahmed trying their best to work with what material is given to them. In the end, both of these characters are forgettable, despite their importance to the story (in both plot and character development). The rest of the cast are in more minor supporting roles, including actress Jenny Slate (Zootopia and Gifted) as Life Foundation doctor Dora Skirth, actor Reid Scott (Veep and Turbo Fast) as Anne’s new boyfriend Dr. Dan Lewis, actor Scott Haze (Child God and Midnight Special) as Drake’s head of security Roland Treece, actress Peggy Lu (Awkward and Animal Kingdom) as Mrs. Chen, and actor Emilio Rivera (Sons of Anarchy and Mayans M.C.) as security lobby guard Richard. As I said, most of these characters are minor supporting roles to the movie’s narrative throughout the film, but at least all of them give solid performance in their respective roles. Lastly, much like a lot of comic book superhero movies of late, Venom does have two post-credit scenes, with one mid-credit and the other after the movie credits have finished. While I won’t spoil it, the first one sets up events for a future installment (if one does get green-lit), while the other is more of a “sneak peek” at an upcoming and highly anticipated comic book movie. However, this “sneak peek” has really nothing to do with the Venom movie and is probably attached to this film because of that the fact that both movies are being released by both Sony Pictures. The world has enough superheroes and its time to “embrace” you inner anti-hero in the new movie Venom. Director Ruben Fleischer latest film sees the iconic Spider-Man villain in his own feature-length movie, showcasing the origins of the character and how he pairs with Eddie, who (in turn) must comes to grips with this alien parasite living inside him. While the movie has some humorous dark humor pieces, a brisk runtime that mostly keeps the entertainment level afloat, and a full committed performance from actor Tom Hardy (who again carries the movie on his shoulders), the film can’t escape its dated / derivate nature, especially when examining its thinly-written story, its lazy script, its clunky / wooden dialogue, some iffy CGI sequences, and a weak villain and love interest. Personally, I thought this movie was just okay, but more towards the lower end of being spectrum. It’s not as terrible or as horrible as some of the critics and reviewers are making it out to be (i.e. citing that Venom is the equivalent to 2004’s Catwoman in terms of being bad film), but the movie never truly leaves up to its own inherit hype, especially when considering the current landscape (or “filmscape” if you will) on today’s superhero features. Definitely could’ve been better. Thus, my recommendation for Venom is decisive “iffy-choice” as some will love it, while other will hate it, and some lingering in the middle of the two, including myself. This is definitely gonna be a movie that will many out there spilt on the overall likeability of the feature. With that notion, it will be interesting to see how Venom will ultimately play out at the box office and (if it receives a sizable return) if a Venom sequel will be greenlit by Sony Pictures. Again, it’s too early to say. For now, Venom is a messy superhero movie that’s undoubtedly flawed, but carries that “so-bad-its’-good” vibe.